Here's a list of some more of the fascinating sights in Christiansted VI you'll want to explore. Government House is an impressive U-shaped building on King Street at the corner of Queen Cross, just a block or so from the Christiansted Historic Site. It was originally built in 1747 as a private residence, purchased for use as the colonial governor's mansion, and later combined with other nearby townhouses to form the imposing structure that exists today. It's still used as the USVI governor's residence when he's on St Croix. Open to the public unless there's an official function going on. Lord God of Sabaoth Lutheran Church is just west of Government House on King Street. It was built in 1740 as a Dutch Reformed Church and later taken over by the Lutheran congregation when they vacated the Steeple Building. The church is still an operating house of worship even now. Market Square was part of Frederik Moth's original 1734 design of the town. It was used as a public marketplace for the sale of fresh produce and craft wares created by local artisans. On Saturday mornings you can still find a few local farmers selling their produce here. Apothecary Museum was a Danish colonial pharmacy founded in 1820 to serve the needs of locally stationed Danish troops. It was still operating as a pharmacy up until 1970, when the last owner retired and donated the contents to the St Croix Landmarks Society, which restored it in 1996. Contains exhibits of 19th century pharmacy glasswares and equipment. It's located at 4 Queen Cross Street. St Croix Archaeology Museum highlights pre-Columbian Taino and other native artifacts like flaked stone tools and shell implements dating as far back as 4000 years. Open Monday and Thursday only, 10 AM to 2 PM. The Waterfront/King's Wharf There's a boardwalk here which extends from the Christiansted VI seaplane terminal to the old wharf area. Very picturesque, a great place to take a stroll, drop into some shops, or stop in for a cool drink at one of the several cafes overlooking the waterfront. 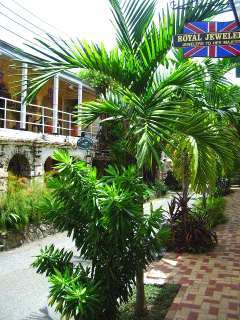 Protestant Cay is a small island in the harbor, just 200 yards from the town's waterfront. Home to Hotel on the Cay, there's a ferry that runs from the wharf in front of the Old Customs House from 7 AM to midnight ($3 roundtrip). Protestant Cay has a good restaurant, an excellent watersports center, and a good, sandy beach - the only one in town.